This has been around forever with cameras! There are only two shutter manufacturers, IIRC, and the bigger the shutter - such as FF and MF - the bigger the problem, along with smaller lenses. I don't mind shooting at ISO 200, 400 outdoors in order to double or quadruple the shutter speed in such cases. EFCS really does help but there is the rolling shutter for moving objects, only works in Live View, and you can't use flash with it. All of which strikes me as "good photographer" material in anyone's book - would you agree? Absolutely. I think these observations are important part of becoming a good photographer. Devising a work around and using them when you notice shutter shock is part of the process too. Im just saying good photographers know the limitations of their equipment and work with them. Sounds like the OP is switched on. Also I would think if the OP took offence then they might say so themselves? I've often wondered if some of the shutter shock problem is caused by internal vibration/motion of the lens elements. The fact that the SR mechanism can stabilize long lenses and simulate anti-aliasing at up to shutter speeds of 1/1000 of second implies it very very fast and should be quite capable of handling shocks and vibrations on the relatively slow timescale of 1/80 to 1/200 second. Has anyone seen hand-held shutter in any of the old small manual focus lenses. The SMC Pentax-M 28mm F2.8 is a mere 156 grams -- about the same as the 43 and lighter than the 31, 35, and 77. It the K-1 suffers from shutter shock with light lenses, it should show it with old lenses, too. But, these older manual focus lenses tend to have more solid construction and damped lens motion so they might not show the problem if it is side effect of the light-weight lens motion systems needed for AF. Absolutely. I think these observations are important part of becoming a good photographer. Devising a work around and using them when you notice shutter shock is part of the process too. Im just saying good photographers know the limitations of their equipment and work with them. Personally, I didn't come across or even consider the shutter shock effect until a couple of years ago. Even now, knowing how to work around it with the combos I know can produce the effect more noticeably, I suspect there are some instances of shutter shock I experience that I don't even know about. I think there's an element of personal tolerance involved too. Sounds like the OP is switched on. Also I would think if the OP took offence then they might say so themselves? There may be something to that, PO. Damping and resonances are all part of it, so different behavior with different combinations. How the mass distribution/its nature affects things can be hard to know, but it may be useful attaching a mass to the K-1. For example a tripod head and/or the battery grip (you mention the monopod helping). Whether you actually want to carry the camera that way is of course relevant, but still it may be useful to know/be a fall back. Also I would think how you hold the camera would have an effect, as the hands (and possibly the face) should be able to absorb quite some recoil. Shutter shock is nothing new. Best to know how your camera and lens combination is affected by the shutter speed and then work around it. I think that is what good photographers do? Here's a quick annotated example. You'll notice, if you look hard ;-), the 1/100 version has what I'm seeing as an example of shutter shock in the affected 1/160 to 1/80 range. The other shot is at 1/50 - it is sharper and does not have that fainter, double image that I've put down to shutter shock. All my other shots show this faint, doubling which just adds to an overall blurring. On a tripod it's not there. I suspect mass of the tripod may be absorbing some of the vibrations, maybe similarly to battery packs that have been reported to have alleviated the problem, somewhat. Just checked back on my monopod sequence (shake reduction ON). There is a slight degradation in the image in the affected range - it is not relevant to me. As I can get down to 1/25th easily with a monopod - I use it a lot. I suspect I will be using it even more now when I'm not lugging my tripod around. Last edited by BarryE; 03-22-2019 at 02:06 AM. I actually use the electronic shutter most of the time that I am shooting on a tripod. It takes care of the issue. I haven't particularly noticed it when I am hand holding. As others have said, some cameras are more affected than others. Reports of the K-1 II seem to indicate that it is less with it than with the K-1 original. At the same time, shutter shock gives a pixel or two of blur to an image that is probably not going to be noticed in most smaller print or viewing sizes. The following can as a surprise to me. Yes I'd known about the reports of shutter shock, but I'd not experienced it, owing to the way I normally work, ie tripod/MUP/remote etc. I have been unimpressed by my new FA43's performance for a while. I bought it as a walkabout lens for a K-1. Earlier this week I set out for a shoot having decided to set the camera up using handheld,TAV, f5.6 & 1/100 for the whole shoot - just as an exercise. Getting home the images were all soft. Which made my wonder about shutter stock, and sure enough it's completely clear that I have a problem if I want to use this lens this way. First off I don't like LV (and therefore ES), preferring to compose using OVF. I also appreciate this mechanical issue exists in many other cameras across different brands, so I'm NOT attacking Pentax - I am just rather surprised how obvious the problem was with the lenses below. So here's what I found from multiple tests, using two K-1 s, and using a variety of hand-held techniques/positions. On all of the following lenses I repeated the tests using my normal tripod/MUP/remote set-up as a base - it was completely consistent -no instances of shutter stock were experienced using the tripod. FA43 - the shutter shock is very noticeable between 1/80 and 1/200, with and without shake reduction. It was the worse lens I tested. FA35 f2 - the shutter shock is very noticeable between 1/80 and 1/160, with and without shake reduction. FA31 f1.8 - the shutter shock is noticeable between 1/80 and 1/160, with and without shake reduction. FA77 - the shutter shock was there in this same range, but greatly reduced. I also tested using a monopod with shake reduction on - the shutter shock was there, but not anyway near as pronounced. So both K-1s with these lenses are being spoilt (I need to define 'spoilt' - for me, as I sell images up to A1 size, the blurring in this shutter range would render these images unusable. For smaller viewing sizes, there would be no problem). Unfortunately, this shutter range (between 1/80 and 1/160) is a range that I naturally drop into when on walkabout, due to light, subject matter etc. For most of my needs a tripod or monopod is always going to be my default, so I'm not that bothered. However, as this exercise started off as an experiment to force me into a different way of working it has failed from the start, which is disappointing. 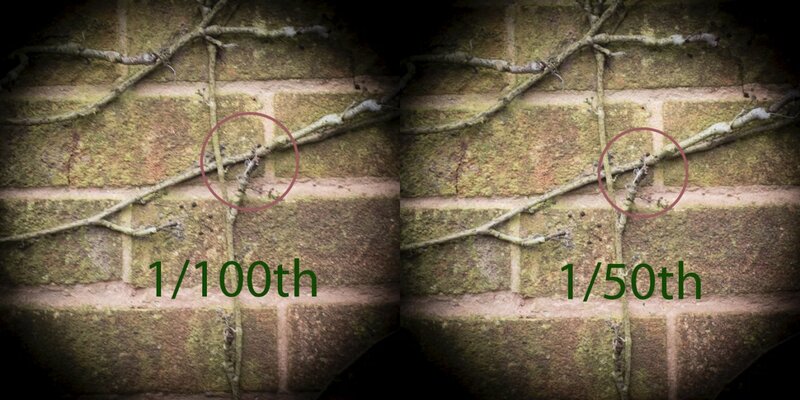 It does make me wonder what of my other lenses are likely to be 'spoilt' by shutter shock ... Guess I need to check. I wonder if some folk's opinion of the FA43 is linked to this noticeable problem...? The lens on a tripod is great, in the centre. Yes it's a little weak at the edges, but handheld in the above range, it's hopeless, for me. I agree. I use a K-1 for landscapes, almost always on a tripod. I feel the same way and prefer to compose using the viewfinder. However after composing and adjusting settings as needed I routinely switch to LV with ES now on and take the shot (The camera is set for ES which turns off automatically when using the OVF and back on when LV is started). I also use a 2 second shutter delay. I have both the FA 77 and 43 and haven't noticed shutter shock or any other negative effect when using this simple method. I haven't been able to read every one of the many posts on this thread an it this has already been covered I apologize. Last edited by wanderer2; 03-21-2019 at 03:22 AM. I agree. I use a K-1 for landscapes, almost always on a tripod. I feel the same way and prefer to compose using the viewfinder However after composing and adjusting settings as needed I routinely switch to LV with ES now on and take the shot (The camera is set for ES which turns off automatically when using the OVF and back on when LV is started). I have both the FA 77 and 43 and haven't noticed shutter shock using this simple method. I haven't been able to read every one of the many posts on this thread an it this has already been covered I apologize. If you use pixel shift, it automatically uses electronic shutter (I use PS quite a bit with landscapes). Here are a couple of shots typical of my kind of shooting....not really practical to drop shutter speed (subject in motion) and the ISO is high enough s it is (low light) The FA35 and FA43 are my staple low light lenses on the k1! A bit off topic but as the picture of the train scrolled up on the screen, the first thing I saw was an "evil skull" in the smoke above the train. And if you run the numbers of the likely subject distances and subject speeds, you'll find that residual amounts of motion blur at those shutter speeds would mask the shutter shock effect. 4. non-LV, SR enabled - slightly less detail than 3., but much better than 2. To conclude, SR greatly reduces the amount of both shutter- and mirror-induced blur for me, also confirmed using other lenses, to the degree that it becomes irrelevant for all but the most critical photographs. The aliasing pattern show that 2. is likely not even affected by a full pixel. Even my rather lightweight tripod, using the 2s timer, is reducing the effect to below AA-filter level. What I've seen in a different test series is, that there is not much detail to be gained by pushing ISO above ~400 to get out of the shutter speed range - the noise eats up the amount of preserved detail. Another observation is that the "denser" lenses (FA77, FA32, Voigtländer CS 20) indeed seem to be less susceptible than F50/1.7 (in contrast to DFA50 Macro) and DFA 28-105. So it's likely both the camera movement as well as some induced "lens wobble" contribute. Even with my 70-200/2.8, the effect is detectable, but then this is also an 'OS' lens, so this is not surprising (lens OS off, camera SR on). Yes, definitely - for the most part, anyway. For me it's completely irrelevant most of the time. The only lens I have experienced this to be a (for me) real world problem with is the DFA28-105. But I also recognise that others, like the OP, have very different requirements. If I printed at size A1 or bigger I'm sure I would worry more about this, too. And knowledge is always good, so a big thank you to those who systematically map out where the problems lie.